Wi-Fi hotspots are helping Australia to become one of the most digitally connected places on Earth, extending coverage of a typical hand held device to about 10-15 km. 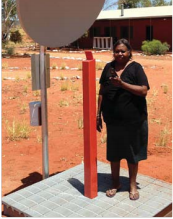 The Centre for Appropriate Technology in Alice Springs worked with the traditional owners of Finke Gorge National Park to install a hotspot which is designed not only to boost signals for the locals, but will also help lost or stranded tourists make that vital connection. Thanks to a platform made from recycled-plastic Enduroplank™ the station is rugged, reliable and needs no maintenance.